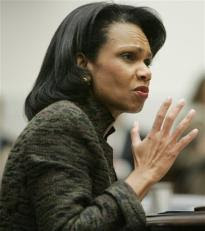 So, seriously, did Condi Rice wear camouflage to her hearing before the senate foreign relations committee yesterday? Wish I could find even better pictures for you. The one on the cover of today’s FT makes it shockingly clear. But a camo-based print certainly is a strange choice, no? Attire parapraxis? Subliminal hint? Acting out? Bald, sticker-on-the-SUV stupidity? White House press secretary Tony Snow said Bush will try to shore up support for the war by raising hopes for victory and spelling out the consequences of defeat. The White House has sought to frame the Iraq debate as a choice between Bush’s plan and abject failure. 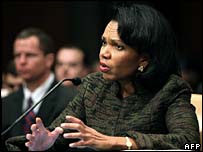 Snow conceded that Bush has a challenge in convincing a war-weary public. “The president will not shape policy according to public opinion, but he does understand that it’s important to bring the public back to this war and restore public confidence and support for the mission,” Snow said. The public has heard several previous campaigns by Bush to defend his Iraq policies and show that he is changing with changing circumstances. Since the war’s start in March 2003, there have been at least seven public-relations offensives by Bush on the war, with some of these speech series timed to milestone events and others to dips in polls. Now, this is very strange talk for an employee of Bush Co., even given the turns that the polls have taken of late. The one thing that it is both easy to forget and essential not to forget is the fact that through every episode of this prolonged debacle, the administration has taken extraordinary steps to tease and/or force public opinion toward support of its policy decisions. It has been incredibly successful in doing so. To the great shame of this country, each and every major action has had the support of a majority of Americans, from the war on down. But now, with his base gone, and even the once comatosely compliant congressional republicans sniping away, we hear from the press secretary that public opinion is irrelevant, and while, sure, it’d be great if the voters came along on the next leg of the trip, there will be no Rovian / Luntzian mindfucking marketing campaign this time around.